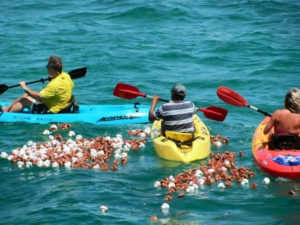 You’ve got to admit there’s something creative, indeed even adventurous, about holding a fundraiser in the form of a rubber ducky race in the actual Sea of Cortez. It’s creative for more than a few reasons: it’s a really fun way for donors to participate in a charity fund raiser – sort of like betting on a horse race, only a whole lot simpler, and way more out of control, plus you don’t have to interview the trainers or call your bookie; and there are at least 1,500 opportunities to make a pun about nearly every aspect of a rubber ducky race that would never work for horses. But most of all, unlike horse racing, 100% of the bets go to a charitable cause, plus the bettors (read: donors) can still win numerous valuable prizes. In fact, it was long time Rocky Point resident Barb Olszewski who came up with the idea of a rubber ducky race on the Sea of Cortez. One of her friends, Art Sloan, a columnist for the Arizona Republic, brought (O.K., smuggled under the seats of a tour bus) 1500 of the now famous palm-sized rubber duckies and donated them to her and husband Mark in case they ever had a reason to use them. A couple of years later, when a young non-profit community center (La Esperanza para Nueva Vida) in the impoverished San Rafael barrio (neighborhood) needed funds to help pay their high summer electric bills to keep their adult life skills classes and children’s activities going, they asked Barb and Mark if they could help. Well, there is no documented record or witness to either Mark or Barb ever saying “no” to any deserving person or entity in need. Hence, the first Great Rubber Ducky Race on the Sea of Cortez that, by the way, exceeded the mission goals. After that first year Barb put the racing rubber duckies on hiatus for a year. After all, a race of this caliber does require quite a cadre of volunteers and equipment including an ocean going vessel, at least two “Ducky Dumpers” synchronized with four to six seaworthy kayaks skillfully maneuvered by as many “Ducky Herders”, at least one deep sea diver (O.K., deep sea snorkeler) and a beach full of conscientious and honest volunteer judges to record the arrival order of the tide-riding duckies. Barb brought them out in 2013 to accomplish the same goal as did their original race. Again, these personable and fun rubber duckies attracted donors from all around and exceeded the goals they raced for. 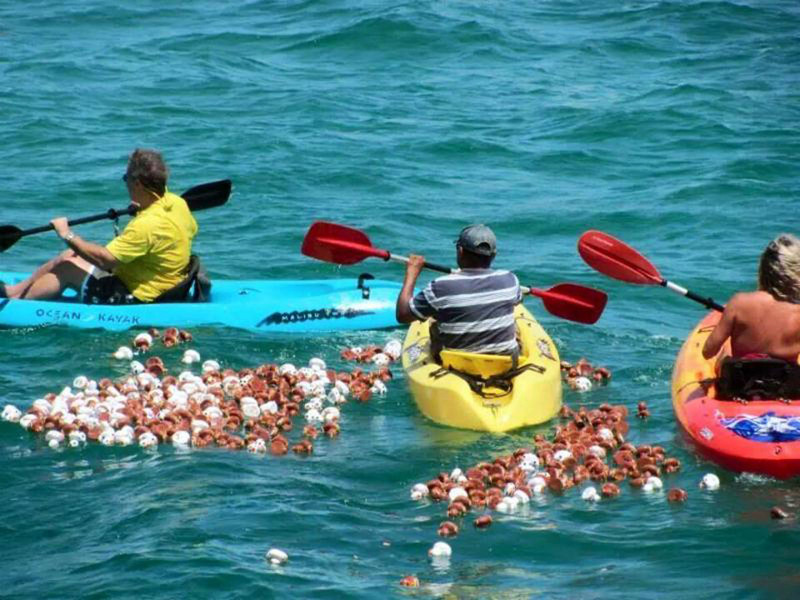 However, it was 2014 that the Great Rubber Ducky Race on the Sea of Cortez seemed to take on a life of its own-assuring its place as an activity we can count on every year for as long as these cute little racers hold out. This year, the Duckies raced on Sunday June the 11th, purposely timed for the same weekend of Roger Clyne’s Circus Mexicus Concert, so more folks could have a chance to purchase Duckies for the race. Remember that 100% of all the funds collected for Rubber Ducky entries will go toward the local charitable causes that Barb and Mark support, so mark your 2018 calendar in May to watch for your chance to be sure to participate next year. Your job is easy-just put your money on a Rubber Ducky to “win, place, or show up before all the prizes are claimed by other Duckies floating in with the tide on a Sunday next June. Oh, and you’re welcome to come out and watch the fun on the beach in front of the perennial sponsors Sonoran Sea and Sonoran Spa, even though you don’t have to be present to win; your Ducky, however, does. Each Rubber Ducky has its own number clearly painted on the bottom. If one of your assigned Rubber Ducky numbers is on the bottom of a Ducky that arrives to shore before the prizes run out, you’ll be the…uhh…Lucky Duck who wins one of dozens of nice prizes that include cool things like Roger Clyne’s Mexican Moonshine Tequila VIP gift baskets stuffed with a T-shirt, Roger’s latest CD, there’ll be numerous dinners at our most popular restaurants; there’s usually a two night stay at a Sonoran Resorts Luxury Beach Front Condominium, plus other overnight accommodations and lots more fun and valuable prizes donated by our generous local businesses and individuals. You can always email Barb at rockypoint@myway.com for more information about the 2018 “Race”, or call her from the U.S. at (602) 324-9529. HOW TO WIN: Invest in Duckies! Build your odds with Barb’s special incentive of one free Ducky for every two you purchase. No Limit! Well…there are less than 1,500 Duckies available. Then, if your Rubber Ducky (with your number clearly marked on its bottom) arrives to shore while there are still prizes to claim, you are a Lucky Duck! You DO NOT have to be present to win any of the fabulous prizes. Your Ducky (or Barb) will contact you if it wins a prize. So be sure to include your telephone number and email address with your entry donation. For great fun, great prizes for a great cause, plus the Lucky Ducky bragging rights until the next year, don’t be a Lame Duck; get your Rubber Ducky Race entry now…and Good Luck, you Lucky Duck! The Rocky Point Times Newspaper and Facebook Page will announce the arrival of the 2018 “Ducky” sale, as soon as we get the information from BarbO.